My post for Democratic Audit (3 April 2014) on NHS democracy. The first Foundation Trusts were launched ten years ago this week, in April 2004. This new model was designed to increase the autonomy of NHS organisations and make them democratically accountable to local communities. The model may have succeeded on the former objective but on the latter they have fallen far short of expectations, I argued. That was Alan Milburn, former Secretary of State for Health, speaking in Parliament in 2003 during a debate about the creation of NHS Foundation Trusts. Launched ten years ago this week, in April 2004, the Foundation Trust model was designed to allow NHS hospitals and other services to be run more autonomously. To achieve Foundation status, NHS organisations need to show they can effectively provide services and manage their finances independently. They must also develop new democratic processes. Firstly, staff, patients and the public are able to become members of a Foundation Trust. Secondly, this membership then comprises the electorate that elects a Council of Governors, the body which holds to account the Board and executive of the Trust. Foundation Trust membership levels are tiny, relative to the size of the communities they serve. Half of all elections to Councils of Governors are uncontested, with large numbers of vacant posts because too few candidates put themselves forward. Voter turnout at contested elections is low, averaging just 20%. Transparency of election information is poor across the sector, with only a small minority of Trusts publishing details of upcoming and recent elections online. Staff: Almost all Trusts operate a policy of automatically enrolling Trust employees as members, allowing individuals to opt-out if they wish to. Public: Anyone who lives in the community served by the Trust can become a member. Some Trusts also allow anyone in England to join. Patient: A minority of Trusts have a membership category for people who are currently using or have recently used Trust services, with some also distinguishing between patients and carers – most Trusts do not separate either of these groups from the general public membership. I looked at a small number of Trusts in detail – of different types and located in different regions across the country – to assess their public and patient memberships. 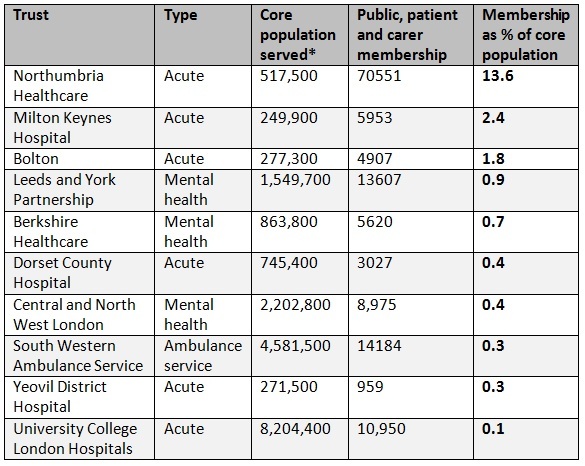 This analysis suggested that membership levels are tiny, compared to the populations served by Trusts, although there are some notable exceptions. *Core populations are defined by the Public Constituency set out in Trust constitutions (available from Monitor), excluding any ‘rest of region/England’ constituency. Mid-2011 population estimates from the Office of National Statistics. Participation in NHS Foundation Trusts election is very low. Elections are held for public Governors (usually in geographical constituencies), patient Governors and staff Governors (usually in profession-based constituencies). Other Governors may be appointed without election from partner organisations such as a local authority, although the patient and public Governors must comprise a majority. I compiled data for 364 elections held across 60 Trusts in 2013, with a total of 595 Governor posts available. I found that exactly half of all elections (182) were uncontested – the number of candidates was the same or less than the number of Governor posts available, so candidates were elected without a public vote. 55 posts were left vacant in total. There were a number of exceptional cases where a large number of candidates stood in a single election: for instance, a public Governor election for University College Hospitals London NHS Foundation Trust had 12 candidates for a single post. The average turnout at Trust elections was just 20.4%. This is the proportion of Trust members voting; as a proportion of the local population as a whole, turnout is much lower. There was huge variation in turnout levels. Among the public Governor elections, the highest was 50.7% and the lowest was 2.9%. At one patient Governor election for Northumberland, Tyne and Wear NHS Foundation Trust – electing a representative for young service users – there were more candidates standing (four) than votes cast (three). These results compare poorly to other types of election, even those which are thought to be marked by low participation levels. Table 2 below shows how participation in Foundation Trust elections compares to London Borough and Police and Crime Commissioner elections on several measures. *London Borough elections in 2010 were held concurrently with the general election, so turnout figures are not comparable. NHS Trust turnout refers to Trust members only; other elections refer to everyone on the electoral register. I tested whether a range of different factors affected participation levels in elections, specifically the constituency of the election and the age, type and size of the Trust. The findings suggest that none of these factors play a significant role in determining whether an election will be contested or election turnout. Considering constituency type, the data does suggest that elections for public Governors are more likely to be contested than either patient/carer Governors or staff Governors, although the public category also has a lower average turnout. One possible interpretation is that public constituency elections tend to attract a relatively large number of committed activists as candidates, but fail to engage the wider local community. The age of the Trust is based on its authorisation date – the date at which it achieved Foundation status. It might be assumed that older Trusts would have higher participation rates, as they have had greater time to engage and inform the local community. However, newer Trusts tend to have higher contestation and turnout rates, as shown in Table 4. This may be an effect of new Trusts learning from the best practice of older Trusts when designing democratic structures. The ‘type’ of Trust is based on the services provided, with three categories: acute, mental health and ambulance service. Acute Trusts tend to cover smaller areas than mental health and ambulance Trusts, with services used more regularly by a greater proportion of the community. This, however, does not translate into higher participation levels, as shown in Table 5. To estimate the size of each Trust, I used to data on the number of Trusts members in the staff constituency. As almost all Trusts appear to operate a policy of automatically enrolling employees as Trust members, this gives a good indication of Trust size. It might be assumed that smaller Trusts would have higher participation levels as they are more easily able to engage a clearly defined local community; alternatively larger Trusts may be able to devote greater resources to public engagement. The analysis is inconclusive, however, with no clear trend in contestation or turnout rates. Information about elections to Foundation Trusts is generally unavailable to the public. Of the 60 Trusts for which I collected data, only 13 published full detailed election results and upcoming election notices on their websites (21.7%). Others Trusts gave overviews of which elections had been held and who won in the annual reports, but this does not represent timely or accessible feedback for ordinary voters. The most common refusal was from Trusts which declined to release the names of losing candidates – they considered this to be exempt from FOI because it was personal information. In one case a Trust also refused to release the names of winning candidates. Several Trusts claimed membership and election information was already published on their website, even where this was not the case. Several Trusts stated that detailed breakdowns of voting were not available because they was held by a supplier rather than by the Trust (most Trusts use electoral services companies to run their elections). One Trust claimed that a detailed breakdown of voting was not available because it used the Single Transferrable Vote electoral system. The Foundation Trust model was designed to enhance democratic engagement between NHS services and the communities they serve. With participation in democratic processes at such low levels 10 years after Foundation Trusts were first established, the inevitable conclusion is that the experiment has failed. No organisation can claim direct electoral legitimacy when only a tiny proportion of the community is voting, and half of all elections go uncontested. Furthermore, the lack of transparency about elections to Foundation Trusts, which are public bodies, is unacceptable. Although better transparency and public engagement may help improve participation, it is clear that more significant reforms need to be considered. There are a number of ways in which this can be done, although the various options are not mutually exclusive. Re-designing constituencies: the large variation in turnout the numbers of candidates across Trusts elections may suggest that constituencies of certain types (for instance, larger or smaller geographical coverage) may have higher participation. Further analysis would be required to establish this. Increasing the powers of the Councils of Governors, for instance in the appointment of Trusts managers, to encourage people that participation in these elections can lead to meaningful change. Aligning Foundation Trusts elections with other types of election. Before 2004 the Government suggested people could be given the opportunity to join Trusts when they registered to vote, but this has not happened. Furthermore, Trust elections are held at different times throughout the year and conducted only by post – co-ordniating them with other local elections may increase participation. Establishing democratic processes within Clinical Commissioning Groups. These are the new bodies that oversee and commission local NHS services. 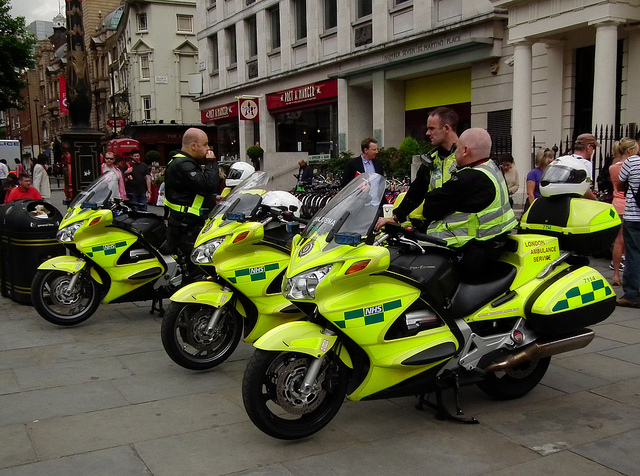 These have a more community-based remit and have the power to shape the direction of NHS services as a whole. Giving more power to Health and Wellbeing Boards, new local government bodies which allow elected councillors to help shape health and social care services in partnership with NHS bodies. The full dataset for this analysis is available to download here. 4 April 2014 in Elections, Local devolution, Research. 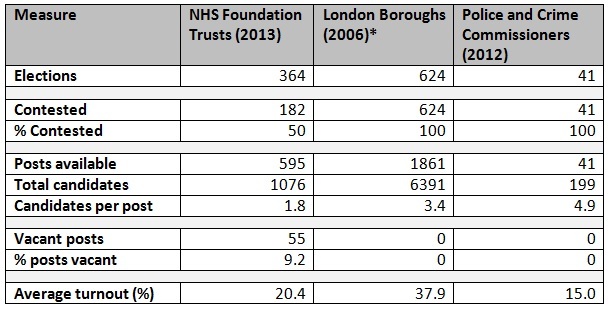 NHS Foundation Trusts – a democratic failure? ← How can we get young people excited about local elections?